Develop 1 Limited Blog | Model Driven Apps are GO! The new Common Data Service for Apps promises to deliver the Xrm platform that we've been after for - well since forever! Today it was announced that it's no longer in Preview and has made it to General Availability (GA)! Of course, with any GA announcement there is also a raft of licensing questions – the most important one for me was around how we can license the CDS for Application and build Model-Driven Apps without licensing for the Dynamics 365 1st Party Apps such as Sales & Servicing. With the licensing documentation released today, Plan 2 appears to be that XRM type licensing, allowing building of Model Driven Apps (Dynamics Apps rather than Canvas Apps) with features such as real-time workflows and plugins. The official license page shows a full breakdown of the license features, but below I've extracted the most important aspects with respect to building Model Driven Apps that we know as Dynamics 365 App Modules. You can see that Plan 2 allows us to build Dynamics Apps without actually having a D365 license – with the exception of this new term 'restricted entities'. Conveniently, there is a list of which entities these are and the associated Dynamics 365 license required. The main take away is that you need a Customer Service license for full access to entities such as case/kbarticle/SLA and Project Service/Field Service license for the unified scheduling entities – with Plan 2 these restricted entities are read-only. This makes sense, as these entities are required by special functionality that is specific to those 1st party Apps that can only be accessed as part of a Dynamics 365 license. It's worth noting that you can build Model Driven Apps with Plan 1 – but you can only use Async Workflows and Business Rules inside the CDS. 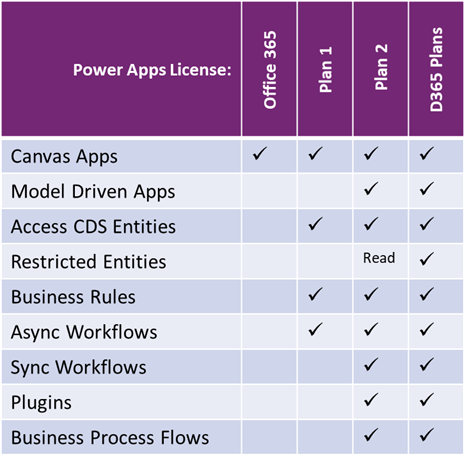 From the licensing description one would think that going for a D365 license instead is cheaper since you can get 1 Customer Engagement Plan license for the IT Admin/Developer to create a custom Unified Interface app and license all users with Team Member license instead which are way cheaper than PowerApps Plan 2 license and provides greater access to the platform. Am I missing something in that statement?? It's true that the licenses are no aligned yet - but the Team License doesn't allow you to use many of the Dynamics 365 CE features such as App for Outlook and Relationship Assistant.